With optimized support for a wide range of industry-leading processor platforms, 6WINDGate enables developers to maintain a single, unified application software platform that can be deployed across a product portfolio based on one or more processor architectures. 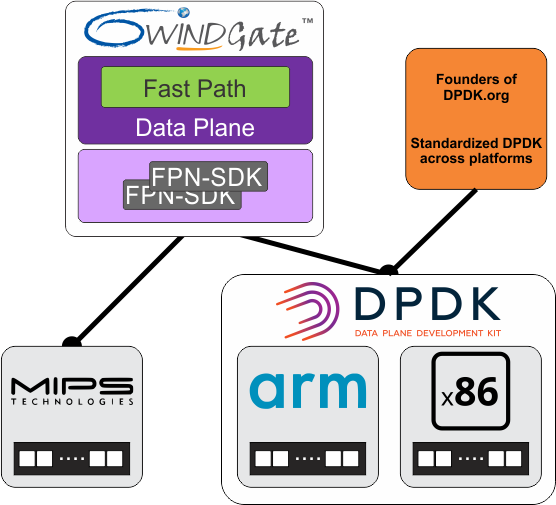 The source code of the 6WINDGate fast path protocols is generic, based on a high-level API for packet handling (header manipulation, chaining, cloning), crypto, hardware queues, timers, locks etc., called the “FPN-SDK” API. This API is implemented using the Software Development Kit (SDK) specific to the target processor and uses appropriate capabilities of the processor when available (falling back to software when not available). Example of such capabilities are checksum computation, specific crypto instructions or asynchronous crypto engines, hardware queues etc. 6WIND works closely with leading processor manufacturers to ensure that 6WINDGate fully leverages the performance, security and reliability features designed into their multicore architectures, while also making full use of the services available in their SDKs. As an example, on Intel® Xeon® processors or ARM platforms 6WINDGate leverages the Data Plane Development Kit (DPDK) poll mode drivers to receive and send network packets directly to and from the fast path independent of the Linux networking stack.